Trainer Todd Pletcher has removed Malagacy (pictured) and Battalion Runner from Kentucky Derby consideration. Trainer Todd Pletcher announced that Malagacy and Battalion Runner will not race in the Grade 1 Kentucky Derby on May 6 at Churchill Downs. Malagacy will be pointed to the Grade 1 Preakness Stakes on May 20 at Pimlico. Battalion Runner will be freshened at WinStar Farm and target the Grade 3 Dwyer Stakes at Belmont on July 8. The defections of Malagacy and Battalion Runner allow Lookin at Lee and Sonneteer into the Kentucky Derby field. Group 2 UAE Derby champ Thunder Snow was confirmed for the Kentucky Derby and is expected to train at Churchill Downs on Tuesday following his U.S. Department of Agriculture-mandated, 42-hour quarantine. Derby points leader Girvin returned to the work tab at Keeneland on April 29 after being treated for a quarter crack in his right front hoof, and conditioner Joe Sharp said his colt remains on target to run for the roses. Girvin will wear bar shoes on both front hooves to protect his recent and a previous quarter crack until Derby day when noted equine podiatrist Raul Bras will be consulted about whether or not the colt should race in them. Trainer Mark Casse said likely Derby favorite Classic Empire will school in the Churchill Downs paddock and visit the starting gate during Derby week. 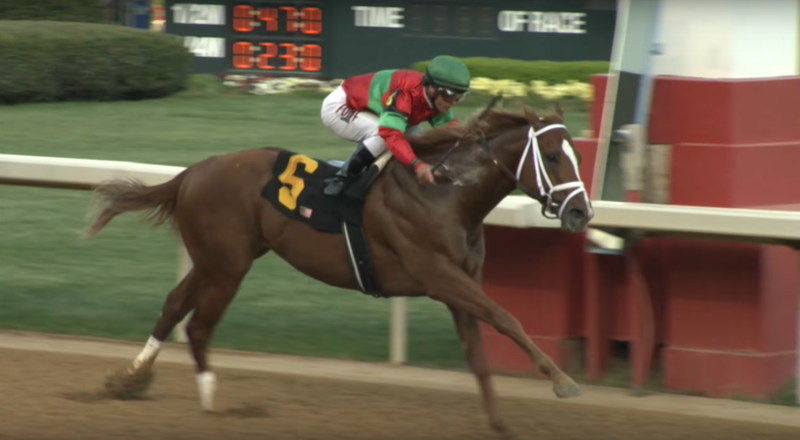 Conditioner Steve Asmussen’s three confirmed Derby starters, Hence, Untrapped and Lookin at Lee, will gallop two miles each at Churchill Downs on April 30 and have their final workouts on May 1. Grade 1 Santa Anita Derby first and third-place finishers completed their Kentucky Derby preparations on April 29 and are scheduled to fly from California to Kentucky on May 1. Grade 1 Wood Memorial Stakes victor Irish War Cry is scheduled leave Maryland early Monday morning by van and arrive at Churchill Downs that evening.